Boxing is one of the most important skill-sets when it comes to fighting. Not only does boxing teach you how to flow with your punching combinations, but it also teaches you good footwork and head movement. Some of the most technical boxers such as Floyd Mayweather and Vasyl Lomachenko use world class technique to defeat their opponent. Floyd Mayweather does this by using his amazing defense and counter punches, while Vasyl Lomachenko does this by using his versatile offensive striking. In this guide we’ll be able to show you the steps to become a better boxer. 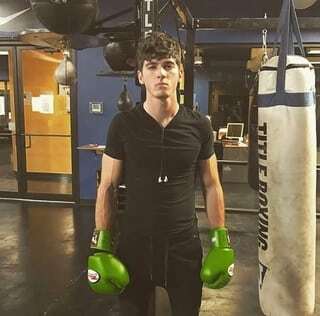 How do I Become a Better Boxer? There is no easy path on the road to becoming a better boxer or a better fighter. While it’s true, some people are naturally good at fighting, the “prodigy” as we call them. However, nothing beats hard work. Fighters such as Conor McGregor, and Boxers such as Floyd Mayweather, are two different sides of the spectrum, but at the end of the day they both worked extremely hard to get to where they’re at now. They might not be the best role models, but with that amazing fighting ability comes a massive spotlight on everything they do. I included Conor McGregor and Floyd Mayweather together because of their “Notorious” boxing match that will be talked about for centuries. However, they might have more in common than one might think. Floyd Mayweather is a notorious counter-puncher, he studies opponents movements and waits until they are most vulnerable, and then he strikes. Conor McGregor is also a counter-puncher believe it or not. His movement is also unique and super elusive, standing in a traditional Karate style stance. McGregor may be the more aggressive of the pair, however, he still studies his opponents movement and attacks when they are at their most vulnerable state. There is something that boxers can learn from traditional martial artists. That is, having the ability to remain patient until the time is right. Ultimately, standup fighting is an art form, having the ability to block, duck, or slip punches easily will allow you to have an overall better fighting flow. At the end of this guide you’ll have an idea how to become a better boxer, we’ll even give you the special recipe on how to become an overall better fighter. It’s ultimately up to you to put in the hard work and dedication needed to become a better fighter. Today we’re going to teach you how to fight like Vasyl Lomachenko. Lomachenko is one of the most versatile strikers today because his elusive head movement and his ability to switch stances with flow and ease. It doesn’t matter if you’re strictly a boxer, Kickboxer, or an MMA fighter looking to get an all around better stand up game. Our How to Become a Better Boxer guide will be able to show you have to strike like Vasyl Lomachenko. As a boxer, throwing one punch and having one punch that you repeat again and again is great, however, being able to effectively delivery two, three, or even four punch combos can make your punches devastating. It’s usually not the first big punch that knocks someone out, it may rock them in a fight, but it usually won’t knock them out. It’s generally the quick punches after the big punch that finishes your opponent. We’re going to start out with some beginner boxing combinations that every boxer should master. The reason why we use the wording “Lead” and “Rear” instead of “Left” and “Right” is because when switching stances this can get confusing. Someone who is trying to master all styles of fighting should be able to fight in both Orthodox (Left foot first) and Southpaw (Right foot first). This is obviously better suited for MMA because it gives your opponent a different look for takedowns, while in boxing you’re only using punches and most boxers preferably only master one stance. However, Vasyl Lomachenko is the perfect example of a boxer who has mastered striking in both stances, if you want your game to be like his, you’ll have to learn both as well. Yes, the basic 1-2 jab-cross is naturally the first combination you learn how to throw. It’s the first two punches you’ve ever thrown together and you’ve probably been doing it long before you started boxing…probably on your little brother or your annoying next door neighbor. The fast jab catches your opponent off guard and the right cross takes his head off. You can actually win entire fights simply by mastering the 1-2. This one is a way to trick your opponent. The 1-1-2 works because your opponent might be expecting a 1-2. If so, then the second jab has a good chance of surprising your opponent opening the way once again for your big rear hand. The 1-1-2 is also good if you feel that your opponent is waiting for your right cross to throw a counter. Instead of throwing your usual 1-2, you will throw endless jabs testing your opponents reaction until he slips up and you put a right cross in there. Don’t hesitate to throw your one and then “feint” your jab and finish with the cross. This is where boxing starts to get fun. The shift of your weight when you throw the right hand naturally sets the lead hook up. The lead hook comes after your cross and can put some massive hurting on your opponent. You can aim it high at his jaw or low at his body (shovel punch on the body at a sideways angle). Either way, the lead hook is equally dangerous regardless of whether or not the cross lands. This is nothing but you throwing 1-2-3-2. The jab opens your opponent’s guard. You follow-up with 3 big power punches: rear hand, lead hook, rear hand finish. When the 3 big punches land beautifully, you can pat yourself on the back. This is one of the smoothest combinations, Muay Thai fighters use this combination daily. This combo is the same as the last except instead of a lead hook, you put a lead uppercut in there. The lead uppercut will surprise your opponent since it’s coming from a downward angle. If your opponent likes to hide behind his high guard with his head down or if he likes to charge into you, the lead uppercut will pop his head up so you can chop it off with the rear hand finish. Starting with the 1-2 all the time can get a little too predictable. Your opponent might get clever and try to slip the rear hand. Or he might simply anticipate a straight rear hand and just have his guard up. In either case, throwing a rear uppercut into there will do a ton of damage and lift his head up so you can follow up with a lead hook – rear hand finish. You can aim the rear uppercut at the body or the head, it’s your call. Make sure you don’t get too predictable when you do this, because your head is vulnerable to jabs and DEADLY counter lead hooks when you throw that rear uppercut. Sometimes you don’t have room to setup a whole combination. If you’ve got an overly aggressive opponent that’s invading your space, then you don’t have time to start with the jab. Drop a cross on him followed by a lead hook and another big cross. If he’s already wide open, why waste your time with a jab? Just start with the hard punches right away. The 2-3-2 is very good at close range. Dig your feet and make it hurt. This is super important, shots to the body are what kill opponents cardio and makes them open their guard. Any of the punching combinations above can be used or finished with a cross to the body, or a “shovel punch”. A shovel punch (or shovel hook), is a punch that is a hybrid between a hook and uppercut. We say this because you’ll want to land your punch at a 45 degree angle (exactly the halfway point in-between a hook and an uppercut). This type of punch could shut down an opponents liver with one clean blow. Some of the best fighters in the world rely on their elusiveness and defense to win fights. Take Floyd Money Mayweather for example, he wouldn’t have been able to go 50-0 without having world class stand up defense. We talked earlier about how important head movement and footwear is for a good stand up defense. We will show you the basic movements and techniques needed to master a good boxing defense. Quite possibly the best defensive technique (You can’t be hit if you’re not in the range of your opponent). Having good footwork gives you the ability to move away from your attacker with elusiveness. This is also a great way to frustrate your opponent who isn’t going to like swinging at air. This type of defensive technique works best against slower and “heavier footed” opponents. However, footwork also can allow you to create angles and counter-punch opportunities. Click here for even more tips and a boxing workout you can do at home. This is your basic boxing defense. Blocking is the easy way to defend without taking yourself out of range. Requires little energy and little skill. If you really think about it, blocking is not your first defensive skill-it’s your first counter-offensive skill. Simply cover your vulnerable areas, don’t try to “catch” the punch, fire back after you block. Blocking is effective against all punches (as long as you block where the punches are being thrown). Blocking punches in an MMA fight is much different. With 4 oz gloves that don’t cover up too much space, it can be much more difficult to protect yourself from punches, kicks, elbows, and knees. Which is why blocking is only recommended in close range combat when you plan on immediately countering your opponent. It’s much better to learn solid footwork and basic blocking skills for MMA, you don’t want to duck for an opponents kick because this can be very dangerous. It’s easier to use your footwear to move back or to the side to evade more advanced strikes. Keep Your Guard High: Half the palm of your glove should be covering the side of your face while the other half should be sticking out so you don’t get caught with your nose or chin sticking out. Stay Loose Then Tighten: Keep your guard up high and stay compact, but remain loose, not tense. Only tighten your defense (like a turtle shell) as a punch is coming towards you. Keep Your Eyes Focused: Even though your guard is up high, you’ll be able to identify when your opponent is going to make a move if you focus on his center chest / chin area. You will see his shoulders moving especially when he throws hooks. Tuck In Your Chin and Elbows: Keep your chin down low towards your chest and your elbows tucked in covering your kidney sections. Maintain Your Stance: Always maintain your original foot positioning in your stance. This gives you stability and keeps your weight centered so you don’t get knocked off-balance. When you get cornered or trapped on the ropes, it’s harder to maintain your stance, which is why you move out that vulnerable position. Block and Counter: Don’t try to block everything that comes your way without counterpunching, otherwise your opponent will lose respect for you and will overwhelm you with punches. As soon as you feel their glove touch your glove, come back with a short cross or lead hook (your main counterpunches when blocking). This is an effective technique for both Boxing and MMA. Parrying should always done on the same side the punch is being throw. If you’re opponent throws their right hand, only parry with your right hand, and vice versa. The parry is a great way to wear out your opponents by using their momentum against them. It works best against guys that take more energy to commit to their punches, especially power punchers and long-armed punchers. The power punchers are always committing tremendous body force which is an opportunity to parry their punch and create openings for your counters. Long-armed punchers are especially vulnerable to parry since they have take longer to retract their punches. The shoulder roll is incredibly effective because your body can roll off your opponent’s best shots with ease while keeping your hands free to counter faster. The shoulder roll relies on rhythm for defense and effectively neutralizes entire combinations at even close range. The drawback to the shoulder roll is that it is ineffective against smaller, faster shots like the jab–which are thrown the majority of the time. The shoulder roll can also leave you highly vulnerable to a punch if you get faked and/or roll in the wrong direction. Though you’re blocking the punch, you should always roll with it to minimize the impact of it and to get yourself in position for a counter or to block the next punch. This is crucial when facing big punchers because just the force of their punches will cause your body to shift if you don’t roll with them. Slipping is one of the most skillful defensive boxing technique. It requires complete evasion of the punch by displacing the head or body to one side. To slip a punch, a boxer will usually go to the outside of the oncoming punch. It is incredibly effective in that the opponent misses entirely and your hands are completely free to counter or escape. Slipping is very useful against faster opponents, however slipping is one of the hardest techniques for a fighter to master. Slipping creates huge vulnerabilities in your opponent (they will be wide open after missing a punch). It isn’t realistic to slip entire punches combinations, always time it so that you’re slipping on the last punch. Slipping will create an effective opportunity for a counter-punch. Remember, right when you slip you either need to counter or block yourself again, this is a very dangerous position to just sit in. Mastering boxing will take years and years of hard work and dedication to do. However, this guide has given you the opportunity to learn and grow. “Defeat is the secret ingredient to success” – Conor McGregor. No matter how many times you’re defeated or feel self-defeat, you can rise up again and become successful. You won’t become the worlds greatest boxer overnight, but through following The MMA Guru’s become a better boxer guide, you should be able to become better than you were yesterday. Boxing is all about making small steps and gradual improvements throughout time. No matter if you’re just beginning your boxing journey, or if you’re a fighting veteran, you can always make improvements in your game. No one is flawless, and no one is untouchable (although boxers like Floyd Mayweather make it seem that way at times). The best defense is a good offense, but having an offense like Vasyl Lomachenko wouldn’t hurt. The MMA Guru wishes you the best of luck in your quest to become a better boxer and an overall better fighter.